Why Do Shoulders Snap or Pop? Shoulder snapping or popping is a very common complaint. A grinding sensation in the shoulder is even more common. The shoulder is a very complex joint so there are many structures that can snap, pop or click when they are injured or inflamed. The shoulder contains muscles, bones, tendons, cartilage and a bursa. Those tissues interact and move upon one another like a complex ballet. Often times the clicking or popping you feel is simply normal because all of these structures are moving on one another. Sometimes the popping or grinding in the shoulder is because something is inflamed or damaged. When our tendons become inflamed they swell. That swelling can tighten the spaces available for all those complex inter-relationships and the structures in the shoulder may start to make sounds when they move. The most common causes of painful shoulder popping include rotator cuff tears, bursitis, labral tears, biceps tendon problems, and arthritis. I see between 5-10 patients a week who are simply in my office because they want to know – Why does my shoulder snap, click and pop? Most of you are worried about the sounds your joints are making. It’s a natural concern. You’re not sure if it’s normal or not. Some of you have pain and want to know what’s causing the pain and the new sensation. Read on… I’m going to try to help you sort through whether or not your popping or grinding shoulder is mostly “normal” or is it due to something that should be looked at further. In another post I describe the things to look for to know if you had a serious shoulder injury. The shoulder is a very complex joint composed of bone, cartilage, ligaments, tendons, and two different tissues which line the inside of our shoulder joint spaces. We call those tissues that line the inside of the spaces the Synovium and the Bursa. If any of these structures are injured or simply inflamed (and thus thicker), the smoothly functioning shoulder can pop, snap or click. These “injuries” can be simply due to everyday use, a sports injury, chronic repetitive stress due to sports, or significant trauma from a fall or accident. Most of the this inflammation will subside on its own. Most of the time the clicking or snapping in the shoulder is due to everyday use and changes that occur over time within our joints. As we age this causes some of the surfaces to roughen —thus when they rub against one another they will snap, click, or pop within the shoulder. For most of you, painless snapping or clicking of the shoulder is not an issue to worry about. For many of you, the popping or clicking may eventually subside over time, or you may simply get used to it. Painless clicking and popping usually does not require any treatment at all. If your shoulder hurts when it pops, or if the popping and snapping started after an injury then you should consider an examination by an Orthopedic Surgeon. Below is a discussion of the most common causes of painful shoulder snapping and popping. Clicking or popping of shoulder may start soon after an injury. That might mean that you have sustained a serious shoulder injury. Here are some situations when the noise coming from your shoulder could signify a problem. If your shoulder was injured and it is now sliding in and out of place (dislocating), it may snap or pop. if the biceps tendon is moving around too much or dislocating from its groove. 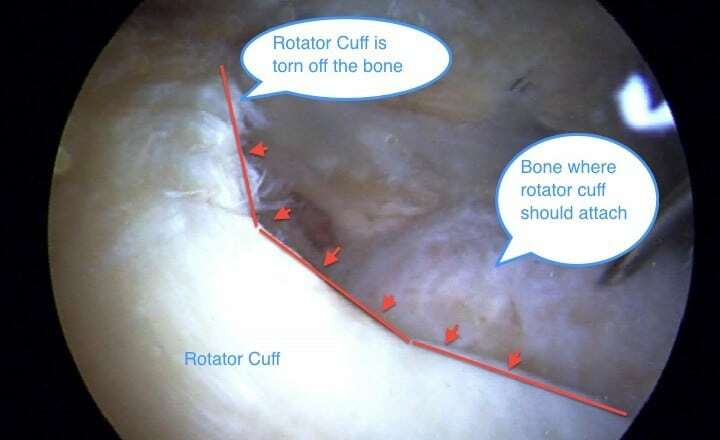 If the rotator cuff was injured or torn. If the labrum of the shoulder was torn. A piece of cartilage has torn loose and you have a “loose body” getting caught in the shoulder. If the snapping is in the back of the shoulder, it could be an issue (often bursitis)with your shoulder blade or scapula. if you have calcific tendonitis,the inflammation could make the shoulder click or grind. The shoulder is composed of two main bones, the ball and the socket. The shoulder is similar to a golf ball sitting on a golf tee. Imagine that the golf tee has a rubber washer sitting around the edge. That is exactly what the labrum is in the shoulder. It is a rim of cartilage around the socket of the shoulder. It serves as an attachment for the ligaments, and it helps the ball of the shoulder stay in position. If the labrum or cartilage in the shoulder is torn a result of an injury or repetitive stress (pitching), then the labrum may have been torn from the bone If the labrum is torn it can catch in the shoulder and cause a pop or a snap. People with painful popping or their shoulder dislocates due to a labral tear may respond to physical therapy. 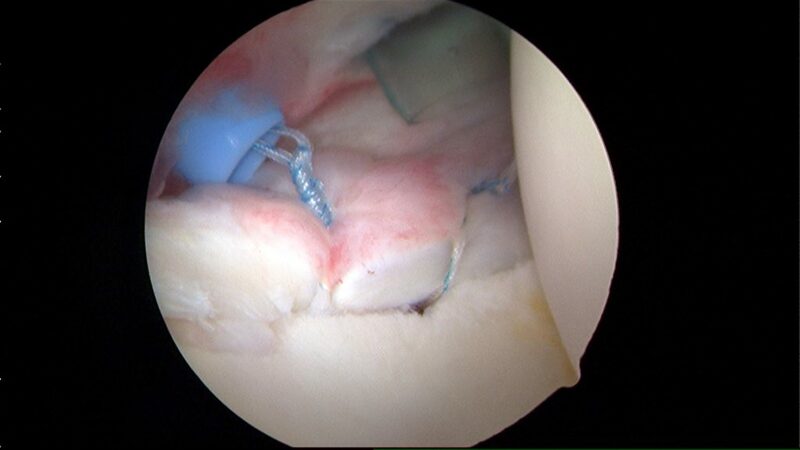 If after therapy your shoulder continues to dislocate, or has a painful catching or popping you may consider an arthroscopic surgery on the shoulder to repair the labrum (see picture below). A SLAP lesion is simply a tear of the top of the labrum in the shoulder. Labral tears cause different symptoms based on where the labral tear is. For example. SLAP lesions typically do not allow the shoulder to dislocate, but it can cause popping or catching. Tears in the front or back of the labrum can cause dislocations of the shoulder. See this discussion to learn more about SLAP lesions. As you can see in the picture about, a rotator cuff tear can cause abnormal senations in the shoulder. If the rotator cuff tendons are torn then there is a loose edge within the shoulder that can catch on other ligaments or structures in the shoulder. This may lead to painful snapping or popping. In addition, a rotator cuff tear, or rotator cuff tendinosis can cause a secondary inflammation in the shoulder(bursitis). We call that inflammatory process bursitis. When bursitis is present in the shoulder then the bursa is swollen and will cause clicking or grinding. Click here to help determine if you have a rotator cuff tear? Click here to learn more about the treatment of rotator cuff tears. Shoulder dislocations are a common cause of popping in the shoulder. 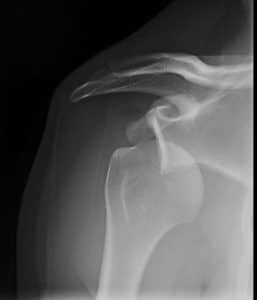 If the ligaments in the shoulder were injured from an acute injury, the shoulder becomes loose and start dislocating. This can lead the ball of the shoulder to slide up or over the edge of the socket. When the ball then falls back into place it may cause snapping or popping. This section on shoulder dislocations delves further into detail on shoulder instability. For more information. 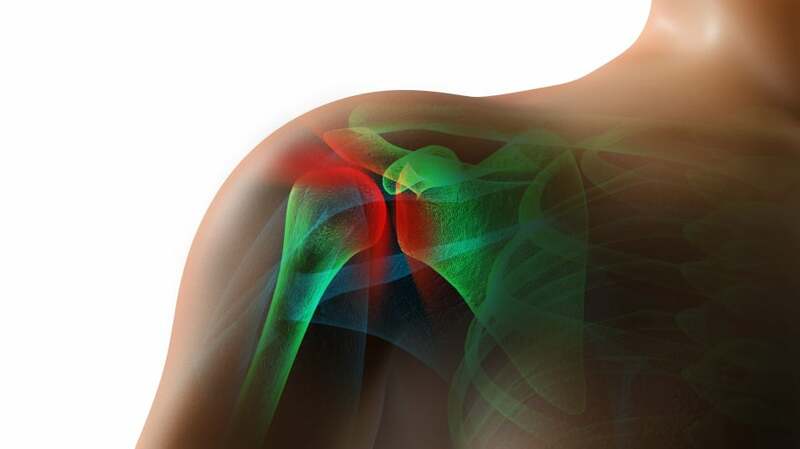 Click here to learn more about shoulder dislocation surgery. This is the picture of a loose body in the shoulder and can serve as an obvious case of popping or catching. Arthritis, by definition, is the loss of cartilage or the cushioning on the ends of our bones. If the cartilage in the shoulder is rough, thinning or absent, the surfaces of the shoulder will be rough and therefore cause clicking, snapping and popping. 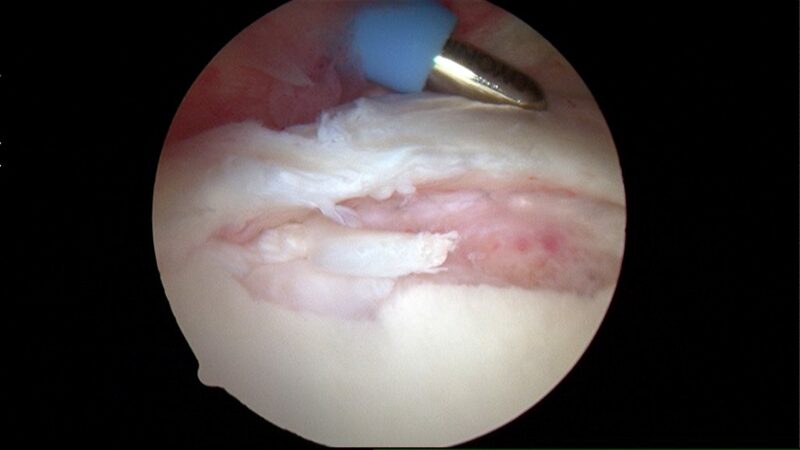 Notice that the cartilage here is literally peeling off the bone underneath. These flaps or pieces can cause clicking and popping. Rest assured that the majority of shoulder snapping or clicking is *normal*. If you have pain, or if you are concerned –or certainly if you’re snapping or popping started after an injury –you should be evaluated by an Orthopedic Surgeon trained in Sports Medicine to examine you and determine why your shoulder is popping or clicking. An MRI might be necessary to see if the shoulder labrum is torn, if you have loose bodies floating around, if the biceps tendon is unstable or if osteoarthritis of the shoulder is present. ← What are the most common causes of shoulder pain? What about if somebody has had a torn AC in the shoulder and dislocated shoulder? Because now after my injury every time I work out I have a painful pop in my shoulder and also I some mobility issues with it, for example bringing bench press all the way down to my chest is near to impossible for me and if I do it feels as if my shoulder will pop out at any given moment. Do you have any advise, for a 18 year old on what is the best fix/ help the problem? Dylan… if your shoulder feels unstable and you have a history of a prior shoulder dislocation, you should consider seeing a sports medicine doctor who specializes in the treatment of shoulder issues. Once the source or reason for your dislocation and current apprehension is determined, you can then talk about the alternatives available to alleviate the problem. I am 16 and have not had any injury that I am aware of. However, every time I move around my arms or shoulder,my back and shoulders pop and crack nonstop and is often painful. Also, the pain seems to radiate to my neck as well. It is quite hard to describe how it really feels but it just feels like every single bone in my upper back and shoulders are cracking. Hi Joy.. I’m sorry you feel this way. Have you seen a pediatric orthopedic surgeon? It might be worth your time. I never hurt my shoulder but when I was 16 my shoulder started popping extremely loud (not painful though), then as time went by I noticed the popping was softer and less rough. Slowly, my shoulder became weaker. It’s been 5 years now since the popping started. It hardly pops now but I can’t have my arm up for more then a number of seconds before my shoulder feels too weak that I have to bring it down. I can’t throw a ball more then a couple of times because my shoulder will be really sore the next day (and that is when the popping is more frequent). I can live with not using my shoulder much (as I have these past years) but I want to know! I would like to do boxing or tennis or baseball but having my arms up is impossible! The pain the day after is harsh. I have never had a shoulder problem. I am 45 and was on a trampoline ride of sorts where you have to wear a harness around your waist and its connected to some rubber bands on each side of me. You pull on the rubber bands like a parachute cord and jump on the trampoline getting height. Anyway i never felt any pain or problem while doing this but a day or so later felt pretty sore in arms and shoulders. Once the soreness went away when i move my left arm in certain directions it feels like a pop and hurts just for that instant. It feels like a tendon or something shifts in my shoulder and only hurts when it moves/shifts slightly. I pulled my car door shut today and i felt some pain/soreness not a pop or shift just sore when pulling. It does not hurt at all while not using it. It has been a couple weeks and still the same issue. I have not taken any medicine at all. I worked out the other day and bench pressed no problem, but if i try and lift a weight from my waist keeping my arm straight and lift up to the height of my neck/ shoulder it hurts in the outside shoulder. Any ideas of what my problem is or even what i should do. Should i leave it alone for awhile and see if it goes away, take an anti-inflammatory, use heat or ice?? Have you found out what the cause was? My name is Heather and I am 25. I have never had a shoulder injury before, but for years my right shoulder has had a catch in it and pops a lot. It has progressed to the point that it catches every time I feed my son a bite of food(arm stretched straight forward) and every time I have to get something off a shelf. I have to pull my arm behind me to get it to release and then it pops loudly. This isn’t necessarily painful, just annoying when caring for my children or even grocery shopping. Any advice? Heather… If this has persisted for a while and you are concerned… a good history and exam should be able to tell you what’s going on. I would suggest seeing a surgeon who specializes in the shoulder. I’m 25 and have been experiencing pain in my shoulder/biceps/triceps/chest for the past 5 years on and off. My shoulder pops when I roll it but does not hurt. If anything, it relieves the pain a tiny bit. My doctor says its normal but when the pain comes, sometimes its in my arm only or chest only. I noticed that with increased stress, the pain comes on strong. My doctor recommended doing Yoga. Should I seek another opinion? I would continue to seek opinions until you have an answer. Painless popping at your age could be related to the labrum and/or posterior instability…. I am not s physician, but I have trained S&C at the high school level, and lifted weights and studied exercise myself for 31 years. With the help of your physician/medical professional, you should be able to quickly identify if this is the case for you, and establish a treatment program. Jake… There are many reasons why our joints pop and snap. Some of you have “loose” ligaments which allow your joints to slosh around and move “in and out” of place. Most of the times this is not of concern… especially if there is little or no pain associated with it. hello. im 17 year old and when i touch my shoulder and move it in the circles i feel lots of bone movements like jumping against each other… i love to exercise because i wanna join in army next year… while exercising like doing push ups i can hear little crackling not loud… there is no pain and my shoulder is little bit weak i can hold it in the air for like 1 minute then its getting little bit tired… but there is no pain and nothing… is there a problem or is it fully normal? It may be normal for you. Many people have loose ligaments that lead to the shoulder bones moving around more than in other people. Unless it is painful, it is unlikely to be an issue. (Age 33) I was diagnosed for positive rotator cuff impingement on 06Feb 2013 and after getting some medical treatment by ortho they now (8 April 2013) say that I got no impingement anymore but I feel some snap and pop when I move my injured hand sideways to all the way up above my head. I am not doing any shoulder workout anymore bcoz I got little bit of swelling on the back of my injured shoulder recently. Swelling subsided after couple of days but I am confused whether I should start my shoulder therapy workout or not? Do I need another MRI to get a more clear picture? Please reply and help. Further imaging seems like a good idea in light of the swelling and persistent painful mechanical symptoms. A very good morning to you. As per your advice I went to an orthoped doc and asked if I need to go for a 2nd MRI but since I didnt have any pain in my shoulder area, even when lifting my hand above head, the ortho doc advised me not to go for another MRI and gave me some prescriptions like Bravia-D, Ciplax 10, Cobadex czs (sorry I may not be 100% correct with the spelling) and a vit-D tablet. What do you think about the the above mentioned prescriptions? Is it the right kind of medicine for a rotator cuff injury to heal? I dont have any problems or pain lifting my hand at all but still there is some cracking or snapping sound coming out from my injured shoulder when I try to do some therapy workout. Could you please give me some idea as to what may be the reason causing such sounds. Please reply and oblige. I shall remain thankful to you always. Hello, I’m sixteen, I’ve just started working out again, after being inactive due to a family crisis. It’s been about a week since I started working out, and just today, I noticed that my right shoulder is off. It popped and cracked today while I was doing push-ups, and now it feels weird. There is little pain, only when I touch the area, but I feel slightly weaker in my arm now. From diagrams I’ve looked up and by touching the area, I’ve noticed that the tissue around the “acromion”, (at least I think that’s what it’s called) feels looser than the other arm. There are so many reasons while a shoulder can pop and snap. Even more when you’re 16 and your growth plates are open. If you are able to work-out then continue doing so and see if your symptoms improve. If they do not improve then consider seeing an orthopedist in a few weeks. (Age 14) Everytime I move my shoulder it pops and cracks. It has been going on for quite a long time but does not hurt if I’m not involved in sports. It constantly hurts when I’m actively involved in either soccer (im a goal keeper)or softball. What should I do? Maxine… Painful snapping in an adolescents shoulder — especially for a young woman, may mean that your shoulder is loose… Perhaps it’s time to see an Orthopedist. I have had 5 shoulder surgeries and am looking at a total shoulder I am only 44. I developed an infection after they pinned my biceps on a previous surgery. The last surgery they moved the bicep because of the infection and inflamation. I have been on antibiotics through and IV for 6 weeks. No guarantee that they will get rid of the infection. This morning my shoulder popped and it hurt I don’t want to call my doctor for fear that he will say something is wrong. Is it normal to have a loud pop with pain 6 weeks after a surgery? I am still in therapy. A few things… first, in a shoulder that has arthritis, the surfaces are rough. Second, after multiple surgeries, there is likely to be scar tissue as well. Combined those can produce popping sounds, grinding, clicking etc. One thing to keep in mind.. after an infection… even if it appears to be gone, your risk of developing an infection after a shoulder replacement is quite high. There are steps to take to minimize this risk, so make sure to let the surgeon who performs the replacement about your history of an infection when the time comes. My left shoulder has been popping for a few months and I is painful, I went to the doctor and he gave me medicine that is not doing anything, and now I cannot lift my arm higher then my shoulder and now the pain goes into my upper arm and sometimes down into the lower arm, it feels like someone is shoving something sharp in my shoulder and even if I try to reach for something it hurts really bad, I cannot get my doctor to take me seriuosly and I am worried that I am making it worse, Have even thought about getting a sling to try and rest it. A sling might help with pain relief, but in the end, may lead to a stiff shoulder. There are many reasons for a popping shoulder to be painful. Perhaps not the answer you want to hear… but you simply need to find an orthopedist or doctor willing to listen to you and educate you about your shoulder condition. Sounds like an exam by a second sports doc might help you… always helps to put another set of eyeballs onto a problem that persists. hi there im 32 yrs old and ive been having shoulder pain for 10 yrs or so now I constantly have to pop my shoulder to relieve the pain after holding something for a period of time and when im sleeping at night and if I have my left arm above my head on my pillow when I wake up my left shoulder is in severe pain and hurts to move my arm for a few minutes I had an xray and a mri done 2 yrs ago and the xray showed I have a healed clavical fracture that I never knew I had cause I didn’t hurt like a broken bone or anything and I have noticed that my left shoulder is a lot lower then my right shoulder the MRI I had done shows a joint separation and they noticed a slight bicep tear in my left arm I went to one surgeon and he didn’t know what to do so he sent me to another surgeon and she recommened physical theopy but 2 yrs later im stil in a lot of pain and tired of it . I went to an orthopedic surgeon after having an MRI on my right shoulder that showed LHB &subscapular tendinosis and an Arthrogram/MRI showing a slap tear. I have constant pain from my upper back and neck all the way down to my right hand. The surgeon gave me a cortisone shot and told me I could return to my job as a cashier on Monday with no restrictions. According to most things I haveread, this will not help my tendinosis heal. What are your thoughts on what my next step should be and his form of “treatment”. He didn’t mention any kind of physical therapy or anything. Just to see him for a follow up in 5 wks. Hi. I’m 22 years old, and for the past eight or nine years, I’ve had off and on popping and clicking in my left shoulder. It’s generally not painful, although it’s susceptible to aching in cold/humid weather, or when I’ve overexerted myself. When I perform any exercise that involves lifting weights over my head (no matter how light), there is a more obvious clicking that, while not painful, exactly, makes my shoulder feel weak, and as though it could become painful easily. I suppose my question is, is this a cause for concern? hi im Chris im 22 live in Cumberland MD. I’ve been having pains in my shoulder it cracks and pops when i rotate it and hurts to hold my arm up for to long and i get these random sharp pains that only last a second or 2 but will go down the edge of my shoulder blade and im getting like cramps in my bicep an forearm I’ve been to the hospital and they tell me its a pinched nerve had x-rays and a MRI the x-ray showed nothing and the same with the MRI. trying to find a orthopedist or someone who can help me solve this do you have any idea? I’m stumped… well sort of… You need to be examined to better determine what the source of your pain is. Sorry I can’t be of further assistance with these complaints. Hmmm … it would be hard to comment without knowing what your X-ray shows. If you fractured your scapula (shoulder blade) and it didn’t heal perfectly well it could be catching on soft tissues under the scapula… hard to say without seenig you and your X-ray. I am a 28 year old male. I have an interest in lifting weights. 6 weeks ago during a routine shoulder press, I felt a pain on the outside of my right arm. It feels like it is where the lateral deltoid connects with the arm. Now there is a consistent dull ache, that is exaggerated with any pressing movement. I find anti-inflammatory drugs numb the dull ache. I have tried resting for a few weeks, and also rehabilitating for a few weeks by doing face pulls, and movements to get blood into the area, but the dull ache still pursuits. Some people have told me it could be an impingement, others tell me it could be ligament damage. I am keen to get back to training, but I am not sure what the best course of action is? Are the any injuries in which gental rehabilitation is not a good idea? Very few Matt… If your pain persists, an X-ray and exam is worth it. Usual cause of pain in this region is a rotator cuff strain. I play tennis routinely. Lately, I have felt shoulder discomfort which has kept me from playing- slight dead arm, shoulder popping. When I do ground strokes I feel the popping and I try to stay away from overhead serves because that’s when I feel the majority of the pain. I saw an orthopedic and he said it is most likely the rotator cuff – X Rays showed no issues but never got MRI. I have been doing shoulder therapy with light weights for a month. The dead arm has subsided but the clicking is still present. I was thinking about taking vitamins to help with the joints. Do you have any suggestions on vitamins for joint pain? Suggestions for anti-inflammatory – Ibuprofen or Aleve? I just want to get back to playing tennis competitively. Andrew.. Clicking is not always unusual in the aging shoulder. Especially one that has been active in competitive sports. If your pain has subsided and all you are left with us the clicking then you can likely return to playing tennis. If your pain persists despite therapy and rest then an MRI or ultrasound would be useful to assess the integrity of your rotator cuff. There are no vitamins that I am aware of that will aide the clicking. I’m a 15 year old male and I haven’t had any shoulder injuries. However, I’ve been able to pop my shoulder joint since I was very young, between the ages of 7 and 9 I’d say I started. Now I can pop it painlessly and sometimes I feel like I have to, or otherwise it feels out of place or annoying. I used to throw a lot between pitching in spring and summer, football in fall, and basketball in winter but now the only major throwing I do is football. I feel like I can throw a football really well and the shoulder isn’t hindering that. But after I throw maybe ten balls the shoulder feels suddenly like it’s moved out of place and brings me into excruciating pain. Is this something for concern or just an annoyance that will have to be dealt with because I can pop my shoulder. Jackson.. This sounds like you have instability of your shoulder. In your case it might be due to loose ligaments which are the structures which normally hold a shoulder together. I would recommend you see an Orthopedist who specializes in shoulders. My 16 year old son plays football and was lifting weights (bench pressing) when he felt his shoulder pop out and then back in when he got up (on more than one occasion). He progressively had pain and weakness in this shoulder and eventually was unable to lift anymore. In addition, he was practicing in the Running back position and when he was blocking, the shield went up and under his armpit pushing his arm up and back and caused more damage. The trainer (who is a sports physical therapist) tried to do exercises with him and they were not helping. Took him to an Ortho doc and had an Athrogram MRI done. Found a posterior labral tear (described on a clock, from 6 to 12, for size). Is that a substantial tear? The ortho doc wants to do labral tear repair feeling that therapy will not help the instability of his shoulder. What are your thoughts? Your son is “complaining of” symptoms consistent with instability – where the shoulder is sliding out of place. People with posterior instability (your son) – where the shoulder slides out the back of the shoulder often feel a clunk or pop as the shoulder slides out, and then notice that the shoulder will reduce or slide back in on its own. On the contrary, people with anterior instability – where the shoulder slides out in front many times will need to be seen in an emergency room to put the shoulder back into place. The size of the tear doesn’t really matter much… it’s your son’s symptoms and complaints that matter more. Some people will have a “large” tear with no problems, and others will have a “small” tear with significant complaints and symptoms. From what you have given me it seems that your son would likely benefit from a labral repair – assuming it is performed well, and rehabilitated properly. Make sure you see someone who performs a number of these… they can be tricky. Also be sure you clearly understand the other options (PT, change of sports, etc), the risks of surgery, the post surgical regimen and the length of time your son will be out of sports… and the risk of failure with return to certain sports. Hi. I’m 22 years old, and for the past eight or nine years, I’ve had off and on popping and clicking in my left shoulder. It’s generally not painful, although it often aches in cold/humid weather, or when I’ve overexerted myself. When I perform any exercise that involves lifting weights over my head (no matter how light), there is a more obvious clicking that, while not painful, exactly, makes my shoulder feel weak, and as though it could become painful easily. Hey, Im 24 and Im having the same problem on my right shoulder. The clicking make it impossible for me to do some of shoulder excercises, especially chest dips. And for some reasons, it related to my right chest muscle when I was doing chest dips. Is it normal or should I stop doing chest dips? I’ve been doing calisthenics for a while. If you have significant pain during a dip or press due to clicking or popping in the shoulder I would consider holding off… if you symptoms persist, have an Orthopedist evaluate you. Hi, I was diagnosed 10 months ago with shoulder impingement. An x-ray was normal. Pain was intermittent during this time with some days and weeks of low or no pain. NSAIDs never helped with pain. I only had day time pain, and no night time pain. In the past month, my pain worsened somewhat with an increased number of consecutive bad days. while doing the exercises. But, after a few days my shoulder pain became constant during the day, with pain during the night, with the adfitional symptom of shoulder cracking sounds when waking up in the morning and after doing gentle pendulum exercises. I noticed two very small bruises on my upper arm. I have some pain on raising and lowering my arm, and an increased pain on the slightest movement of my arm. I began taking Naproxen with no benefit after 8 days so far. Ice does not help. A warm shower helps reduce pain. My pain is throughout the shoulder and upper arm with some back of the shoulder pain and some occasional biceps pain. My pain is constant during the day and rest helps, but does not eliminate the pain. I have more pain at night now. I assume my impingement has worsened. Maybe I have a partial rotator cuff tear? I have a follow up appointment with my doctor in two weeks. What would you recommend? An MRI? Cortisone? A longer trial on Naproxen? do an MRI because “he treats the patient, not the MRI” and says an MRI could show lots of things. Your doctor is correct… an MRI could show many things, depending on your age. But if an MRI is utilized to confirm suspicions in a patient with worsening symptoms despite adhering to the regimen — then it might be time to see what that MRI shows. Another reason to proceed with an MRI is the bruising… not typical for patients with rotator cuff related discomfort. I have had my shoulder popping for four or five years now and it seems to be getting worst even though there is no pain. If I take my right arm and make a large windmill motion it will pop from halfway between straight down and straight back until it is straight back. I am 23 and played outfield in high-school and do not remember it starting to pop after anything in particular. Is it a concern just because of how long it has been occurring? Is there anything I should do to help it heal or to prevent further injury? Matthew.. it might be worth seeing an Orthopedist to see if you have posterior instability, where the shoulder slides out the back. Persistent popping is a common complaint in patients who have this. I am a marathon river kayaker and long-distance swimmer. I regularly paddle 40km per week and swim up to 3km per day. I have been having huge problems with my left arm and shoulder over the past 2 years ever since I started kayaking more seriously. Whenever I train for a big race my left arm will, after some months, tense up and tighten….eventually it will crunch…the crunch makes a loud cracking sound, this is followed by months of painful rehabilitation with physio until I can kayak again….now its been 10 months since my last cracking crunch and ime still very very sore….I also have SICK scapula of my left scapula..do you think that this is caused by SICK scapula?? Stuart .. I envy your conviction and dedication! The shoulder is composed of a ball and a socket… the socket or glenoid are part of the scapula. If the scapula is not stable or positioned well because of a primary (scapula) problem or a secondary (shoulder related, rotator cuff related) problem then the true shoulder joint will not function properly. Poor scapula mechanics are the cause of a significant number of issues in patients who present with shoulder pain. The snapping, or popping can be coming from the rotator cuff, labrum or beneath the scapula as well. I good exam, proper imaging and perhaps selective lidocaine injections can help you and your doctor determine what the source of the problem is. Unless the inciting pathology is addressed, the secondary issues will never subside. So I am a baseball player and I’ve had tightness in the front of my shoulder for a while and my it pops when i keep my arm down and move just the joint in a forward circular motion. I’ve been to an orthopedists and physical therapy within the last month and am no longer going tot therapy but my arm still is tight and uncomfortable in the front when I throw. In throwers and overhead athletes, labral tears are high on the list of reasons why. Other more unusual causes can be the biceps, as well as subtle anterior instability. My shoulder has been hurting for about 3 years now. At first it was so very painful all the time. Now, it hurts out of the blue and is painful to sleep on. The pain is very deep. My shoulder pops and it does hurt but slightly relieves the pain for a few seconds. Now aches when I use it too much, it pops, or aches for quite some time when sleep on it. Do you think exercises will help it to heal? Lita.. I would love to answer that yes… but without a formal exam and perhaps an Xray I can not tell you for sure. Many patients will experience relief of pain with therapy and exercise — however it needs to be catered to a specific diagnosis. Hi, I am 22year old and I have pain in my right shoulder. I dislocated it when I was 1 went ti the emergency room and all the gave me was a sling. It seems. That the pain is getting worse and it keeps on dislocating when im doing simple things. I usted to be able to work out and lift 135lbs+ in weights for over an hour and now I can’t even lift five pounds with out being in exterme pain it feels like if I was trying to lift a car. I constantly have to ceack it in all types of directions to relieve the pain. And sometimes I feels the pain or numbness all the way down to my fingers. Its becoming a real problem I sometimes push on my rib cage to crack it. I can’t even sit down in the same position for too long, even while driving I feel the pain on my shoulder blade and ribs. Cracking it usually temporarily relieves thebpain, but im worried that I might be doing more harm than good. I am tired of living in constant pain.What do you think I should do. I am desperate and want to fix the problem before it gets worse. Thanks in advance! Rachel… If your shoulder remains unstable and keeps dislocating after it was reduced in an emergency room you really should see an Orthopedic Shoulder doctor soon. There are many different reasons why your shoulder remains unstable. The treatment for each will vary. Good Luck to you. I sustained an injury 4-5 years ago which tore, what I think from Googling, were the trapezoid muscles in my shoulders and was eventually (as far as I’m aware) solved with a chiropractor’s help. But bad posture brought me to a registered massage therapist with hopes to fix a certain other issue. That hasn’t been as lucky, as the pain still can persist but after just a few visits months ago and some posture advice, it’s not as severe as it used to be (it used to literally keep me from standing). Now ever since I’ve been watching my posture more closely, I’ve got a horrible snapping in my shoulder. Sometimes when I lift above my head it snaps, sometimes when I lift below my head it snaps, sometimes I seemingly don’t even do anything and I still get this snapping. No matter what it’s painful. It’s not audible but it’s incredible painful when it happens and I’m worried it could cause me to hurt myself, as throughout my day or week I do enough lifting above my head to have this as a concern that the pain will cause me to drop what I lift. anyway, what could be causing this and where would you suggest I go next? Chiropractor, registered massage therapist, family doctor? Other? I finally got n2 an ortho sports doc yesterday after about 2 months of severe night pain in the shoulder. I noticed it first at night while laying on it. Then when i went to grab a gallon of milk almost dropped it. Im a stay at home mom but volunteer as a Chaplain at a local hospital so my job isn’t that demanding. Last year after a foot surgery twice – once was with crtches n busted front teeth the pther is with a walker as my freind let me borrow one with wheels and a seat, my youngest daughter was pushing me at church she didnt make it up the ramp n i fell on my back, ended up fracturing tailbone- who knew a year later i would have a labreal hip tear that would be addressed. My Doc say i have an impingement in the shoulder that i hit, he gave me a cortizone shot and so far all it has done is bring the intense pain down to a numbing pain in the shoulder, but i also have back back the shoulder baldes and like the side of my neck on the clavical he say that the one on neck he isnt concerned about. Should he be. And why is there a catching in my arm when it goes up and not down, it coninually pops, depending on what im doing sometimes it can be real loud. Eight or so years ago my right shoulder started popping when rotating clock wise. As the years passed pain and soreness started in addition to the popping. Now my shoulder when extended forward with something small in my hand is getting sore. I can not throw a ball or Frisbee very many times, and I am getting pain when trying to lift something small with my arm extended. I have an appointment to see a doc next week. what do you think is going on? The pain/popping can be coming from many different parts of the shoulder… including the rotator cuff, the bursa, the labrum and the biceps tendon. Without examining you in is hard to say which might be the culprit. I have never had a shoulder injury that I know off, but I do have this weird popping or clicking, not sure how to explain it, noise in my shoulder. I can feel and hear it best when (and I’m going to try to explain this as good as I can) I hold my elbow in a 90degree angle, then move my elbow up to the height of my shoulder (that already gives a soft clicking noise). Then when I move my hand up, so rotating my shoulder (in the position you normally show off your arm muscles), then that whole movement causes several clicking noises and a big pop at the end. I’ve had this for quite some time, at first not even being painful, but when I sleep my arm seems to lock or shift, I don’t know, but when I wake up my shoulder is sore and sometimes I need to pop it hard to get it back working. And in time, the popping/clicking has become more painful, and I also feel it when I lift heavy things (and then it’s painful as well). And then last year I underwent surgery in my knee, because (this is even harder to explain, sorry) there was something in my knee, like a tiny string of..tissue I think, that babies have and later go away, but it was still there, so that was causing a clicking noise and pain in my knee. I’m very glad that my knee is okay, but my shoulder isn’t, and I’m afraid that it’s either the same thing, or something that I can’t easily fix, and that I have to get surgery again. Then again, I do want it solved because it hurts and when my arm feels locked it’s annoying too. I have made an appointment with my doctor in the hospital already, but it’s not until a few months, and I’m making myself scared (probably for nothing). Should I get it checked and what do you think? my son is almost 11 and plays baseball. Recently he complained of a popping kind of on the tip of his shoulder blade when he throws. He said he first hurt it last week while throwing a tennis ball against the stairs inside our house. (he likes to practice catching the rebounding tennis ball with his glove) He has been taking weekly pitching lessons for just over a year and has never compainled of any arm fatigue. I know a former MLB pitcher who looked at a video of him pitching and said he has very good form and throwing motion, for what thats worth. i found out about his shoulder yesterday when he was warming up for a lesson. i cancelled his lesson and held him out of his teams later practice. today he says he feels fine. should i let him resume practice or hold him out for more rest, or take him to a specialist.? Thanks for any reply and for your offering your opinion to others. Without examining your son, I couldn’t comment on why it’s snapping – and thus whether or not he can return. At 11 he is starting to to take pitching seriously at a VERY young age. I take seriously any complaints of pain in a child throwing. The downside can be significant if an injury is missed. Good Luck! Hi Ryan… the description you give can cause a number of injuries. They include the labrum and the ligaments inside the shoulder. If your pain and popping persist for a short while I would see a shoulder specialist. hello, my names matt and i had surgery on my shoulder because of football, someone was in the air and i tried pushing them while they were in the air and my shoulder just fell dead and i could barely feel it and also when i tried blocking someone at an awkward angle and i heard a pop but it was painful. I got it checked out and it was a bony bankart tear. Got surgery on it and now i have been actually lifting now and no more physical therapy. Ok, so before the surgery i would crack my shoulder because there was a relief from it, there was no pain at all in cracking it. All the stress in my shoulder would seem to build up and i would just push on my shoulder and crack it. Now, it’s been about 5 almost 6 months after the surgery and i’ve been feeling pretty good, but now i’m lifting with football and it’s intense and after the first week i cracked my shoulder again(i haven’t cracked it in a long time, maybe just pressure in the joints) but i got kinda scared that maybe i reinjured it or something, even though i didn’t have much pain. I would just like to have a word from you as reassurance because honestly i’m scared and i DO NOT want to go through another surgery, if you want to ask me a more specific question, please do, i’d be glad to answer them, thank you. Matthew… cracks and popping after surgery might not be an issue. Many of our joints will do that after an injury and/or surgery. However, sometimes … just sometimes that sound can mean that something came loose. To put your mind at ease.. if your symptoms persist, see your Orthopedist to be checked out. Great question James… Has your shoulder dislocated since the surgery? Does it feel unstable? After surgery… assuming all went well you should be ok. That being said, failures do occur. I am not aware of a means of putting your shoulder back into place while floating in the water and hanging onto your kayak. Sorry I couldn’t help. Thanksgiving 2006 I was sledding with my family and crashed, falling heavily on top of my shoulder. I thought at first I’d dislocated it and tried to raise my arm and couldn’t. I had it xray’d and it was negative. Eventually the massive bruising drained into my chest. It never improved and I couldn’t use the arm to throw (Fortunately I can throw with my left) What alarmed me was when I saw the same Dr. to xray my heels to diagnose heel spurs in my achilles. He diagnosed it spur free, despite the obvious x ray. I got a second opinion and eventually had a Calcaneus Reduction done to remove three spurs. That makes me have doubts about my 2006 diagnosis. The shoulder is unstable when sleeping and reaching out or bringing my arm down has weakness and pops. It’s fine when I lift anything with the arm at my side or have my elbow tucked in. But little things like reaching up to adjust the rearview mirror can be a mistake. My shoulder makes a noise when my arm at my side and the forearm is bent at a 90 degree angle and I am doing external rotation. People mention clicking, I think it sounds more like gravel. Nothing catches or pops and no pain. Maybe more like a bunch of quick tiny pops? I can hear it. Should I be worried? I’m only 56 and just had my left shoulder replaced (degenerative disease, chondromylacia, severe arthritis and inflammation (and yes, I had pain in that one – for years thought it was a frozen shoulder). .
With a history of arthritis in one shoulder, it’s possible that it is in the other shoulder as well. As the arthritis (loss of cartilage) sets in, the surfaces become rough and you might appreciate a grinding sound. An X-ray and an exam should help with the diagnosis… if you develop pain. When I was 15 years old (I’m 20 now) I slipped and sprained my right shoulder. I went to the hospital to get it check out because i wouldn’t move it and they said it was a sprain and told me to wear a sling until its better. I did that but after my injury when ever I want to grab something really fast it pop put of place and i cant move it for a few seconds then it pop back. After it feels so sore so i try not to use it for the rest of the day. However, two weeks ago the pain got worse. I was trying to grab something again that was taken from me and it popped again but the pain didn’t last over night like it always did, instead it was sore for a few days. I was still able to move my arm just fine but it was a little painful. Last night, it happened again and when it popped i had my arm at 90degree angle and i was unable to move it for two minutes (this was unusual for me) I was unable to move it and my hand was shaking. It popped back in by itself but it is very very sore. Again, I can move my arm i don’t feel sharp pain but it is more painful than i usually experience and can barely use it. I’m planning to get it checked out, but What could be causing it? is it serious? Jessi… Time to see a shoulder doctor… the more times your shoulder dislocates, the more the ligaments stretch. This makes it easier and easier for your shoulder to dislocate… and it can DECREASE the results of surgery — or another way to put it.. increase the failure rate of surgery. I had decompression on my left shoulder a year ago and since the surgery I have occasional soreness in the joint and it feels really tight. I have gone through all of the exercises but something still seems off. What I notice is that my should seems to pop a lot, especially when I’m pulling it across my chest to stretch. I’m planning to go back in and speak with the Ortho, but wanted to get a second opinion. Hello I had shoulder surgery 9 days ago to remove the end of my clavicle, treating me for DCO. I think the doctor took out about a centimeter. I felt great after the surgery, and I have been gaining more and more range of motion every day. I wasn’t having any problems until this morning when I was using a leg press machine. If you know what one of these looks like, there are handles on the side to grip. I was gripping the handles very tightly on one of my reps and my shoulder felt like inside bones were rubbing against each other or something. Now every time I lift my arm over head my shoulder clicks near the end of my collar bone, and my collar bone is very sore. This is the worst my shoulder has felt since surgery and I am hoping I did not harm anything that my doctor fixed. Do you think this I caused any serious damage? I am really concerned about the clicking because it is somewhat painful and before doing this I could move my arm without any clicking at all. Tough to comment Alex… but you were progressing extremely well… might just be a minor setback. It will take weeks for the inflammation to fully subside. If you are concerned you can always check back with your doc. I’m 14 and I can pop both shoulders in and out of their sockets. I have been able to do this for about a year. I was first able to do this after I woke up one morning with alot of pain in my right shoulder. I thought I slept on it funny and I took Advil and it seemed to help. I then realized I could pop it in and out which made it feel better for awhile, but actually made my shoulder looser. I went to 6 weeks of physical therapy, but that didn’t help. So I’m not really sure what to do. I feel like I’m an old lady both my shoulders pop out of socket and the tendons in my legs and feet snap against my bones. Evelyn.. this is not an uncommon story. The answer is usually more physical therapy… 6 weeks doesn’t sound like enough for someone who likely (but not definitely) has multi-directional instability. I am 19 years old and am extremely active. I play on my universities rugby team and lift weights 5-6 days a week. About a week ago my shoulders started to crack and pop without pain, but it still makes me nervous because two of my teammates have torn their labrum’s during the past year. I have shut down working out my upper body due to nervousness. What should I do? If it persists, you might want to see a Shoulder Specialist to be sure everything is ok.
Hi, I’m 18 and during a Karate practice I landed funnily on my shoulder after a throw, it made a load cracking sound and hurt a bit. Now, a few days later it still cracks and pops whenever I stretch my shoulder, the cracking is accompanied with some/minimal pain and discomfort. I don’t really want to go to the doctors if I can avoid it. So what do you suggest I do? At your age George you need to be evaluated by an orthopedic shoulder specialist. Many reasons why your shoulder is popping… labrum, AC joint, inflamed bursa or rotator cuff — only a good exam, and possibly an MRI will be able to tell you what’s going on. After a small sports accident 9 years ago, I started experiencing frozen shoulder, stiffness and extreme pain in my shoulders. Noone could say what it was except for the orthopaedics who said that my condition is not due to the accident but just that I am more flexible than “normal”. In the last years, the only way I could relieve my pain was to try and pop it sort of. Now, both shoulders pop and crack so much when I move and not do anything intentionally. I still have pain and every day is more difficult than the other and I am trying to avoid popping but it became the nature of both of my shoulders. The “noise” is so loud that I get embarrassed simply because people look at me in horror. Finally, which doctor should I go to? Rheumatologists think its not arthritis, and orthos think its flexibility. Rest of the doctors do not think that it is also fibromylgia…. Which sort of doctor would be the best in your opinion? My life quality has dropped and non of the doctors I met could tell me anything and I guess no one realizes how painful both of my shoulders are…. Thank you for your time and advice in advance. Sara… I’m a little confused.. a frozen shoulder implies stiffness and loss of motion… yet someone who is flexible, or hyper-flexible would be expected to have more motion then “normals”. Instability, where the shoulder is too loose can occur at any age. Sounds like a shoulder physician is the proper place to start. Hello all: i had laberal tear surgery debridement & synovitis back in March (or close to it) had 1 month of therapy then 4 wks of work hardening/therapy. I cant lift anything 10 lbs or more straight out away from me, or infront of me over 15 lbs, alot of crackin poppin noise & soreness in a few different movements & i can’t throw a ball very far. Certain movements are very painful failed my FCE for work & doc gave me nuther 4 to 6 wks of therapy all this in right shoulder & i’m right handed the therapists seem to think I need more therapy but they don’t realise the more I use it the worse it gets pain wise & i got a pretty good tolerance for pain but will it ever go away & will i ever have 100% of my shoulder use back, & why does it pop & crack so much with a lil pain but get way worse the more movement or strain i put on it? Anyone have any ideas? 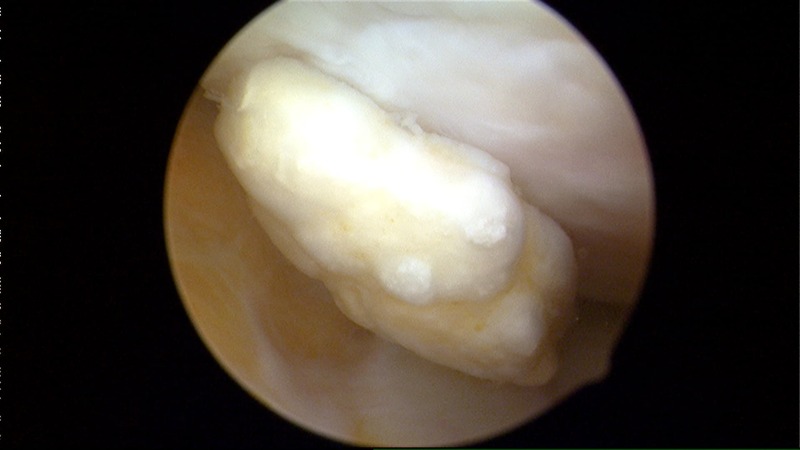 Many many of us of degenerative labral tears … but for most of us, that is not the source of pain. Perhaps something else in the shoulder is bothering you. Without examining you it’s hard to comment further. Hi my shoulder popped out about two and a half weeks ago and since then it has been popping out very frequently. It has popped out probably 7 times in the last two weeks. Every time it pops out it hurts a lot and when it pops out I am not doing anything that would seem to make it pop out (for example it popped out the other day when I was picking my laptop up off of my bed). Every time it pops out it pops back in by itself within a couple of seconds. It has been difficult to lie on it and I have been going to physical therapy but it doesn’t seem to be getting better. Any suggestions on what it is? Yes … :-( But you need to speak to an orthopedist… and likely have an MRI or Ultrasound. The two most common causes of recurrent instability are a labral tear (13-40 yr olds) or a very large rotator cuff tear (most common after 40). Thank you so much for your response. My orthopedist spoke with me over the phone and I am trying to schedule an MRI. I am seeing him next week so he can check it out. Also, I just started having sharp pain that runs down from my shoulder to my elbow. Could this be connected to either a labral tear or a rotator cuff tear? Pain that travels down towards the elbow is usually due to the rotator cuff. Hello again! I’m sorry if I am bothering you but I just wanted to tell you that I had my MRI yesterday and today I found out that I don’t have any tear in my shoulder but I do have evidence of multidirectional shoulder instability. I am going to see my orthopedist again on Monday and I am hoping I can start some form of treatment. I just want to thank you for all your help. In therapy today they had me doing a lil strengthening exercise which hurts like crazy, another patient put his hand on my shoulder as I moved it & said it felt like I was geared in there & recommended I get another MRI/ or Artheogram MRI. I carried a box today w/25 lbs in it plus box weighs 15 lbs & I carry it like a 160 ft it’s all I can do to make one lap & I get to where I allow my left to burden the weight half or lil over half way. Should I get another MRI or roll w/it, I can tell the difference in muscle ache or impingement of the tendons but w/ actual lifting or strain on the right shoulder somewhat feels as if something is pulling apart? Any suggestions to tell what may be the cause? I’m aware the popping & clicking is normal & what are the possibilities of atleast 95% recovery,strength,& range of motion after the next 2 weeks of therapy? HI Joe… Another MRI might not be needed. Popping in the shoulder is not unusual even after we recover from an injury and no longer have pain, or have less pain. Sometimes when we begin the strengthening portion of the rehab we need to start at a very low weight to minimize pain and inflammation. Without examining you I can not provide any further details. I’m 17 and was diagnosed with winged scapula and my posture is suffering because of it. My right shoulder slants bad and my right shoulder is asymmetrical with my left its actually 2-3 inches lower than my left shoulder blade. On top of that my shoulder has a sharp pain a long with intense popping when movement up or down and left or right. Any suggestions? You need to see a shoulder doc to find out why your shoulder is winging. Certain forms of winging are treatable with PT, others might require surgery. A proper evaluation and diagnosis is key. Hello! I’m 24, swam competively from 6-18, and played water polo from about 12-19 and stopped after redshirting my freshmen year of college. I’m not sure when I first noticed it, but my left shoulder pops out when I raise it above my head, with no pain. I mentioned this to the trainers who made me get an MRI over concern of a torn labrum. The MRI showed no labral damage and nothing else was torn or needed repair. I can’t remember if they said my shoulder was subluxing or not.. It’s been awhile! At the time, I was surprised because I’d always had more shoulder pain in my right shoulder (and I am right handed), and thought they would want to determine the source of that. I have very lax joints with limited flexibility… I can’t reach my fingers (not even close) if I put one arm over my back and the other going up. Sorry if that doesn’t make sense! Anyway, I’ve since stopped swimming and started running. Every now and then, one shoulder will suddenly have high pain, where any movement makes everything worse, but only lasts for a few minutes, as long as I don’t move it during this time. Typically it’ll stay sore for a few days after that and then I’ll forget it was hurting. This occurs in both shoulders, but not at the same time. Most recently this happened tonight after a run, as I was showering, doing nothing out of the ordinary. This pain can also sometimes be brought on if I’m crossing my arms very tightly, especially if it’s cold. Any suggestions? When I was playing water polo in college, I was doing PT twice a week…exercises, stretches, massages, STEM. Unfortunately, I started developing pain in my left shoulder, and the right got worse as well, which is why I stopped playing. I’m not sure if this is related, but I also have nerve damage in my left ulnar nerve at the elbow. Again, not sure what caused it, but tests showed it stemmed from the elbow, not shoulder. I had surgery to move the nerve and protect it. I can’t remember what this procedure is called now. In college, the surgeons who saw the MRIs were hesitant to recommend surgery due to a less than ideal likelihood that the surgery would not be successful. Physical therapy did not work… The pain occurs rather infrequent, but I’m concerned that my shoulder will dislocate, especially while doing any overhead exercises, since it already slips with no weight. I guess I’m concerned that if left untreated, it will get worse as I age. I also miss being able to swim (it didn’t hurt to swim, but sometimes I would leave the pool very achy, and a shoulder hating me). I also am unable to perform some yoga moves. For the most part, nothing inhibits my day to day.. Just sometimes and when it does, it’s very frustrating, and very painful. Sorry this is so lengthy, but I’m just curious as to your opinion. I know without knowing my history, there is only so much you can provide, but you might have a different idea than the doctors I’ve seen previously. Many young people with very loose ligaments and shoulder instability have no abnormality (labral tear) on MRI. Procedures such as a capsular plication can be successful, but have a failure rate that is too high for many to accept. You should speak with a few shoulder surgeons and find out why they feel you are a poor candidate. The reason for failure is that even if we tighten your ligaments to prevent dislocation, your ligaments can stretch over time and the same problem can recur . Hi Doctor, thank you for this post. I have a question for you- I had a right rotator cuff tear during sports when I was about 25 or 26 years old. I have done the rehabilitation and now my right shoulder is actually just as strong as my left, as proven in the gym with shoulder presses and overhead presses. However, the shoulder clicks and pops if I move a certain way and most days I wake up to it very tight, and it is slightly bothersome through the entire day. However at the gym there is no pain pressing heavy weight and I have no mobility issues whatsoever. Doctors seem to think it’s merely some scar tissue that is rubbing up against the cartilage/bone and said it shouldn’t be an issue…I would like another opinion. It never seems to get worse, there is never sharp pain, just a dull awareness that it’s a little bit sore right there. I can spend a few minutes stretching it for some temporary relief. Is there anything I need to worry about, or can I go on with life as usual? Thank you! Umm… I am 8 years old. Every time i circle my arms i do not injure myself but i do hear a pop sound. Any way to cure that? ??? Pretty savvy for an 8 year old ! Snapping in most shoulders does not mean that something is wrong. Many of us pop and snap our shoulder knees and ankle. if concerned have your parents take you to see a doctor. Dr., I had just had rotator cuff surgery to my right shoulder. Three weeks after the surgery, i was laying down and as I moved to get up my shoulder cracked so hard and loud and it was extremely painful. Now I cant move my arm without shoulder pain. My shoulder feels loose and like its going to crack again. My surgeon says that I need to wait another week before an ultrasound will show anything because of the swelling. Should I be concerned about the stitching on my rotator cuff being torn again?? Did you ever hear of this happening? It is not unheard of … we’re not sure why that happens, but it could be due to swelling in the tissues within the shoulder. Good luck with your follow up exam I hope all is well. Most commonly this is due to rotator cuff tendinosis and accompanying bursitis. But I suggest you see a doc who specializes in shoulders and have them take a look at you. I have a condition called Ehlers-Danlos Syndrome (Hypermobility Type III). (Diagnosed through a team of genetists). I have since had 5 surgeries: 4 shoulder surgeries for labral tears (2 were open surgeries, the others arthroscopic). The other surgery was for a complete tear of the PCL. Since these surgeries (shoulders 2009 twice and again in 2015 and 2016, knee in 2010), I still experience daily pain and my knee pop, grinds and clicks with EVERY step (also very painful). My shoulders are still causing me pain and making lots of popping and clicking sounds. My knee continues to buckle and is very loose again. I think that the surgeons are afraid to do any more work on me due to the Ehlers Danlos. I am in pain everyday and still trying to hold down a full time job….. Living with EDS III can be very challenging. Trying to treat patients with EDS can be equally challenging. Failure rates are high and frustration levels all around are equally high. I can not offer specific treatment advice in this forum … but finding providers with experience treating EDS patients is critical. So yesterday I was surfing and my arm got stuck in the leash and a big wave hit me and pulled my arm. Now my shoulder hurts if I move it and if I do some movements it will pop. It didn’t pop like that before. It’s the 2nd day of summer and I hope it won’t be too bad. Do think it is bad? I can’t tell you Logan… If the pain, popping persist for a week see an Orthopedist. That was a high energy injury and those can cause issues with a number of different structures in the shoulder. My show lace was stuck on the elevator and I fell having a backpack landed on my right shoulder and doctor said I have a ACL separation. How long does it take to heal. Can’t ride my bike, or go to the gym and getting really depressed. it depends on the grade of the injury… but in general, it can take 4-6 weeks for the pain in the AC Joint to calm down. A doctor told me I had a tear in my left rotator cuff, before all that, I was Wrestling and got slammed hard and landed the wrong way and could not lift my whole arm up it was hurting bad. The doctor gave me a sling and I quited my Wrestling season and put me in physical therapy. And right between that time my shoulder pain (or rotator cuff) kept popping every single time I lift it up. And after my physical therapy was over I’m back into sports. In practice and stuff it feels like it is dislocating or out of place for like 5 seconds every time I do a cart wheel, Wrestling, or even catching a football, and reaching up for something really fast.? What should I do I want to be in sports and all that but don’t know what to do. Sounds more like an issue with your labrum…. perhaps a second opinion who might choose to get an MRI. Hello. I’m 16 and I play tennis at my school. Very recently during practice, my shoulder suddenly locked for a bit and during an overhead, (where I lift my arm all the way up and swing down on the ball) I forced my shoulder going through that “lock”, and now every time I rotate my right shoulder backwards, I feel popping. There is no pain, but I am still concerned as to how severe this injury may be. Will this popping with no pain of the shoulder heal slowly over time? Thanks. Not sure… I would need to examine you… this sort of complaint can occur with posterior instability or posterior labral tears. An exam and perhaps an MRI would clarify it. I would have a shoulder doc take a look at you… At your age it could be a subtle fracture, labral tear, or instability (where the shoulder is trying to slide out of place) … without examining you I can not be more precise. Hello Doc, I am 11 months post op (Partial labrum and rotator cuff tear repair ) and am a pitcher. Yesterday was my first time really going all out.. Long story short I went to let 1 rip max effort and threw it 3 feet over the catchers head and my shoulder popped and felt instant pain sensation so I shut it down. I am really worried right now and it honestly feels like my shoulder is dislocated? Can you please give me your opinion on what might have happened? I set doctors opportunity but it’s not for another week since it’s so busy.. Please let me know Doc! I don’t know Mike… it is possible, but a good exam and possibly a new MRI might be necessary to know for sure. Hi I’m 16 and I play softball, I’ve been pitching since I was 10, just recently I’ve been experiencing alot of pain in my shoulder. Today when I was playing I hit the ball and it felt like my shoulcer seperated. I have a pain going from my shoulder to my elbow. Everytime my arm moves I have clicking in my shoulder and elbow. Should I see a doc or should I just keeping icing? HI Amanda … IF the pain and popping persist for a week or two best to see a good shoulder doc. Thank you for this, it’s helped me understand better how the joint works, which is fascinating (and wonderful for art reference! ), but it’s only let me even more confused on my situation. I’m 19, and I was born really flexible. I can bend my fingers and my wrists really far, and my knees come out slightly since I was 5, but it had never been a problem, however since I was around 14, sometimes my shoulders (either one, but so far only one at a time) will feel really uncomfortable as if I was wearing really tight sleeves, and when that happens, they usually pop out if I move them too much. It feels really creepy, and when they go back in place it hurts a lot. It’s happened less with the years, and a blend of tea I take makes it go away without popping most of the time (thankfully). I’m not especially concerned anymore since I’ve learned to deal with it over time, but I’ve always been curious what it could be. You should first be evaluated for Ehlers Danlos… Then you should see a good shoulder doc to examine you and give you the proper next steps. I had a frozen shoulder and got a cortisone shot. All was good for about 3 months – the pain and limited range of motion has begun to return. Should I go back to get another shot or should I try some physical rehab. I have been diagnosed with a MRI I have a tear anterior posterior to my upper bicep. When I was at work 3 weeks ago something popped and I instantly had excruciating pain, Something in my scapula popped way out and now it is swollen in the back underneath my arm behind my shoulder. I have had intense pain and will be seeing my Ortho March 26 th. . I have never felt so much pain in all my life. What else could I have injured? I work in a factory and very repetitive lifting 5 lb bags of wings. I have worked in a factory for 27 years. Also it is black and blue in a different area where my scapula popped out. Please tell me possibly what else I could have done. My shoulder is also popping and cracking noises. But the MRI said it is in contact. Please tell me what else I could have injured. sorry Jean… without examining you I can not say for sure. Hi, I’m 21 and two days ago I had fallen off, I’m embarrassed to say, a bounce house at my friends party. I had landed on my shoulder with all my weight, and thats a lot of weight, and it was extremely painful and I heard a pop. A sharp pain ran down my whole arm and I wasn’t able to use my arm for a bit. I am accident prone, so, despite my friends concerns, I didn’t see a doctor. It’s only been two days since then and the pain is almost entirely gone already, though I’m sure I shredded some muscles that day from all my vigorous playing(I continued to play despite my injury because I may not be the sharpest tool in the shed). However, if I’m jarred, if I raise my arm high enough and move it in a different direction, or if I try to lift anything of any substantial weight, I’ll feel a sharp pain and hear a popping sound. I’m just curious if, in your opinion, I NEED to see a doctor or if you think it is fine healing on its own. I’m a college student that lives in California and Healthcare isn’t cheap, so if I can avoid it without causing any severe, permanent damage to my shoulder, I will. And also, if maybe you think I should just get a brace and just try to avoid using it for a while? These are the thoughts I had on my own, but of course a second opinion is always warranted. If you think I may have a more serious issue and should see a doctor, I will. Sabrina… I wish I could be of more help. But without examining you I can’t tell you if you damaged anything important. Many injuries will heal over time, some injuries might not and might require an evaluation sooner rather than later. Hey there my name is Kyle am 17 when I was 14 I was working out one day and then dropped to the floor while doing pushups cause there was a blinding pain in my right shoulder now When I started working out at 16 the pain seemed to return a little now 17 the pain really kills me at times cause my shoulder pops when rotating and now my right shoulder has dropped lower than the left am not one who is always sagging or sitting inn proper always trying to correct that. The pain has gotten worse. Time for you to see a good shoulder doctor… Your shoulder should be examined, and perhaps an MRI would be useful too. Hi. I am a 52 year old female with frozen shoulder that started last summer without injury.. I have had an x ray and ultrasound that came back both negative. I have just been able to do exercises at home without excruciating pain. I am getting more range in my movement but have noticed a clicking sound when doing the exercises, propeller and pendulum. Should I be concerned. Painful popping of the shoulder should be looked at by a sports medicine doctor that specializes in shoulder disorders. Popping and pain in a thrower often means that the labrum and /or the biceps is bothering you. Hi, My name is Namya, I’m 13, I’ve been experiencing shoulders pain for a while now. I play a lot of sports but I don’t remember hurting my shoulder. My shoulder pops constantly and then the pain radiates towards my neck. I don’t know what to do. You should see an Orthopedist who specializes in shoulders. THey will most likely refer you for physical therapy. Have you had an examination by a doctor who see people with shoulder problems? I would consider seeing a shoulder specialist— they should be able to figure you why your shoulder is popping and hurting you. Dr, Luks, I believe my problem is from overthrowing a softball several weeks ago. While I am 62 and in great shape, and have worked rotator cuff exercises prior to my current injury, now I notice my should will pop, and usually that provides relief to mild soreness that has built up. But, I have tested my arm motion and any throwing action is simply a no-no, do to a painful feeling. Is it rest for 3-5 weeks with kinesiology tape, or do I need a medical exam. If the pain persists despite rest, and rotator cuff exercises then it might be worth the time for a good examination. I broke my clavicle 5 years ago. I think it is called an overlapping fracture? The bone fused itself together vertically. After recovery, I resumed all normal activity with no pain. 8 weeks ago I fell hard on the same shoulder while mountain biking. My shoulder was sore and after a couple of weeks I was mostly fine. I was able to go on a week long mountain bike excursion. I had pain, but it was manageable. After returning, my shoulder made no progress, so I went to my orthopedic doctor. He determined my rotator cuff is not damaged. He put me in a sling for 4 weeks. Now, at the end of my 4 weeks, my shoulder snaps and crackles. It is not loud and it does not hurt. I am wondering if my “healing” is as done as it is going to get. Should I continue to rest my shoulder and look for more progress or should I just go live my life and resume physical activity? Our tendons often do not like to “rest”. That being said, rest can be a relative term. Rest can imply less weight, less resistance of fewer days in a gym. Completely stopping activity is not the best way to heal sore tendons. If your doctor feels that there is no damage to the rotator cuff then you should talk to them about whether or not they feel that physical therapy would useful. It is not unusual for the rotator cuff/ bursa area to click, and snap, etc after an injury. THe clicking itself does not often imply that there is a serious injury. I’m currently 15 and both of my shoulders constantly pop and I never have once had a shoulder injury. Even when I raise my arm up some it stops to a certain point then pops loudly. Most of the time they do cause pain. They didn’t start popping till about mid- August last year. I talked to the physical trainer here at my school and she said they may just be growth spurts, but the stretches she gave me aren’t working. I don’t know if its just stress on my shoulders from playing many sports or what. I have tried to get my dad to get an appointment scheduled to get it looked at and we haven’t yet. So i’m hoping you might have an idea on what it could be. Thanks. I young children painful popping can be a sign of “instability” where the shoulders are a little “loose”. Many shoulder pop without pain and can be safely ignored. When you have painful popping it should be looked at by a shoulder doctor or sports medicine doc. Hello I had a sports injury from pitching many years ago, over a decade! I have pain and limited mobility to raise my arm above my head is painful. I have various popping and grinding sensations and after throwing around a softball my arm sometimes appears to feel numb. I also feel pain in my arm pit area along with where my bicep meets my shoulder. What kind of doctor should I seek for this? I have lived with this pain for quite sometime. Only here recently it has got worse and I am having difficulty sleeping and evening shooting a basketball. Appreciate your feedback. Four days ago I was in the gym doing curls on the curls machine. Unlike other times, I did not do any light warm up reps, just started out with heavy weight. On about the 4th rep I heard and felt a pop, not very loud. I extended and pulled and heard and felt a loud pop with some momentary pain. I stopped immediately, got my clothes, and went home to ice my shoulder. My pain, strangely, was in the middle of my humerus, facing forward. The next morning I still had slight but sharp pain at that spot on my humerus, and slight pain at times In the center of my shoulder joint. Today, 4 days after the injury, I have full motion with no pain but I can’t yet put significant weight on that arm due to ongoing sensitivity at the humerus. What happened? Does it require a repair? HI David… you should definitely see a Sports Doc for evaluation. There are many possibilities here, and without examining you I cannot be sure which structure you injured.